Another shot of the Hammerhead in Halifax. The deck sentry stands watch here for security. 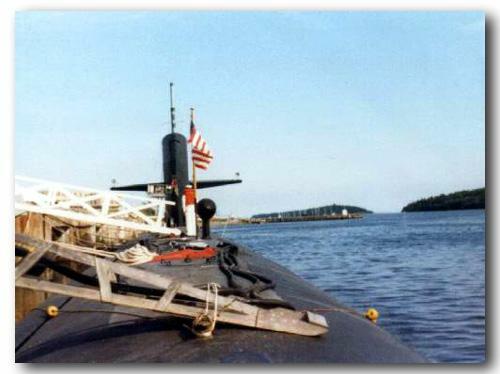 You can see the heavy shorepower cables snaking to the aft escape hatch, the towed array faring on the left, the sail and fairwater planes and BRA-34. Near the top of the sail you can see a small slit in the sail - that is the diesel exhaust for the times the ship is snorkeling. The noisemaker pod is on the starboard side.